H2Flo is a blend of soil surfactants which reduces the surface tension of irrigation water and allows both vertical and lateral movement of water. H2Flo leads the way in water conservation products with the highest concentration of active ingredients (88%) of the most advanced wetting agents available. H2Flo allows growers and farmers to optimize the water use efficiency saving time and energy. 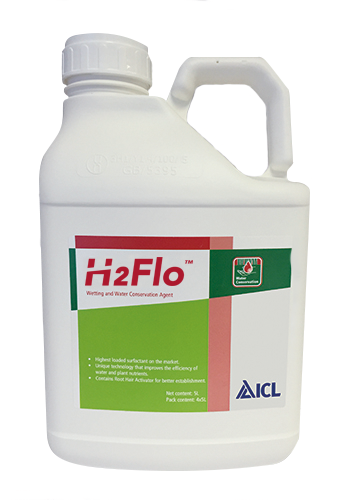 H2Flo can be applied as an initial humectant and also during the normal irrigation cycle where it will also aid the movement of fertilizers throughout the soil and thus balancing the EC levels. H2Flo is a wetting and water conservation agent for use within the soil. It enables quick and total wetting of the substrate and soils, and moves water both vertically and horizontally due to its unique technology. The amount of irrigation is reduced significantly (up to 25%, only in light soils, preferably containing >1-1.5% organic matter) and there is less runoff, especially during the initial wetting. The product can be applied as an initial wetter but also during the normal fertigation cycle where it will aid the movement of fertilizers throughout the substrate and thus balancing the EC levels. H2Flo is ideal for preventing the hardening of water repellent deposits. H2Flo works most efficiently in light, sandy soils which has an organic content of more than 1-1.5%. H2Flo can be applied all year round, by drip, centre pivot and overhead irrigation. (If applied via a boom sprayer please consult your local ICL Specialty Fertilizers adviser or dealer). When using stock solution tanks, please fill them up and add H2Flo afterwards! Best performance: in light - sandy soils, preferably containing >1.5% organic matter. *the monthly applications can be split according to current irrigation schedule. For example, if fertilizers are applied once per week, H2Flo might be applied at the same time, at the rate of 0.3 liter/ha!